The Exodus of Turtleton- EARTH DAY EDITION! 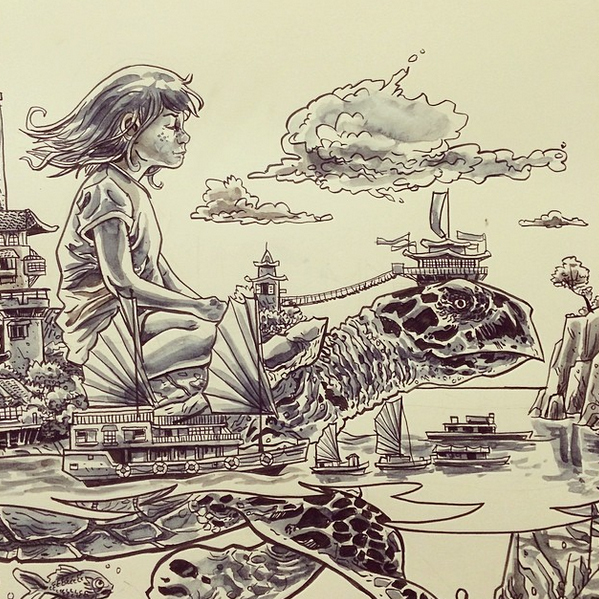 Last year, artist Tim Doyle created ‘The Exodus of Turtleton” print (Which you can see HERE) for the eco-activist organization PangeaSeed. WELL- the print did so well, it sold out before it ever had a chance to hit the Nakatomi site. SO- this year, Pangeaseed’s founder- Tre Packard, asked Doyle if he’d be interested in creating a new colorway of that classic image as part of their Earth Day push! To make this not only a new colorway, but in fact an almost completely new print, Doyle took to the original line-art of the print, and watercolored it by hand to add new texture and depth to the older image, and then he completely re-did the old color films, giving this print a total make-over. Detail shot of the actual painting below! 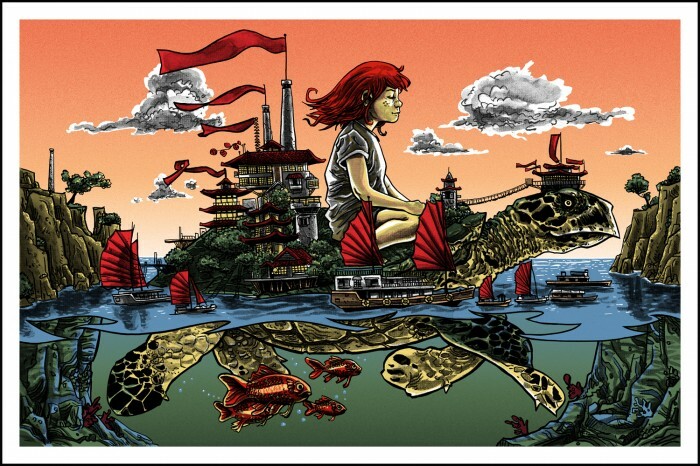 This big, beautiful print measures 24×36, and is signed and numbered by Doyle in a new edition! Print is available for $50 right now on the PangeaSeed Store HERE. Give them a shout, and help out Mother Earth at the same time! ← MYSTERY TUBE SALE THIS TUESDAY 4-22 ! ERMAHGERD!